Centrally located at 111 E. Wacker Dr., the Chicago Architecture Center is truly in the heart of downtown, near the bustling intersection of Michigan Avenue and Wacker Drive. There are three spaces available to rent at the CAC, seven days a week. For more information, contact venues@architecture.org or call 312.322.1130. 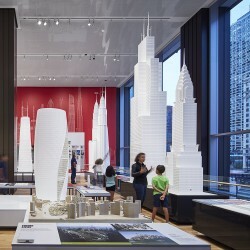 The CAC Galleries rental includes the Chicago Gallery on the first floor, which features the impressive Chicago City Model Experience, as well as the Drake Skyscraper Gallery on the second floor, with supersized models of famous skyscrapers. Stunning views of the Chicago River and icons like Tribune Tower and the Wrigley Building can be seen through 40-foot-tall windows. The second floor also includes the Usher Lambe Rotating Gallery, with regularly changing exhibits. Hosting your event in the CAC’s exhibit spaces is truly a memorable experience. 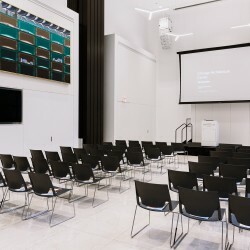 The Joan & Gary Gand Lecture Hall can seat up to 140 people in various configurations, making it a great space for small to medium-sized lectures, presentations and meetings. It contains state-of-the-art audio and visual equipment, including multiple microphones and monitors, and offers recording and broadcasting capabilities for live streaming. 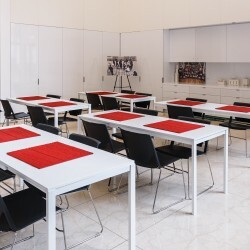 The ArcelorMittal Design Studio is the perfect space to hold your next team-building activity or working meeting. The flexible workspace is designed to encourage creative problem solving and includes a wide range of design tools. A non-refundable, 50% deposit of the estimated total cost is due when submitting the rental contract (due no later than 4 weeks prior to event). Full payment must be made no later than two weeks prior to event. *Security is required for all rentals taking place outside the CAC’s normal business hours. The cost of security is based on the number of attendees and number of hours the space is rented. Contact venues@architecture.org for more information. The Joan & Gary Gand Lecture Hall is available from 8am-5pm Tuesday and Thursday and 8am-10pm the remaining days of the week. The ArcelorMittal Design Studio is subject to limited daytime availability. Please contact venues@architecture.org for more details. The CAC has several pieces of furniture and equipment that can be provided to you as part of the rental cost. Additional A/V equipment can be rented through our exclusive provider. Please contact venues@architecture.org for more information. Extra event equipment must be pre-approved by the CAC. Catering must be arranged with our exclusive caterer, Blue Plate. Contact 312.322.1130 for more information. Please note, no food or drinks are allowed around the Chicago Model exhibit. There are numerous parking options in the area. The closest parking is the LAZ Parking Garage at 111 E. Wacker, located under the CAC. If you have a question about parking, please contact us at venues@architecture.org. Please give us a call at 312.322.1130 or email venues@architecture.org and we’ll be happy to review your options and help you plan a memorable experience for your guests. For more information, please contact venues@architecture.org or 312.322.1130. If you have any questions regarding our spaces or would like to book a venue rental, please contact our group sales department.